Apple cider vinegar is popularly used for its healing properties. It also contains detoxification properties that are effective in cleansing. 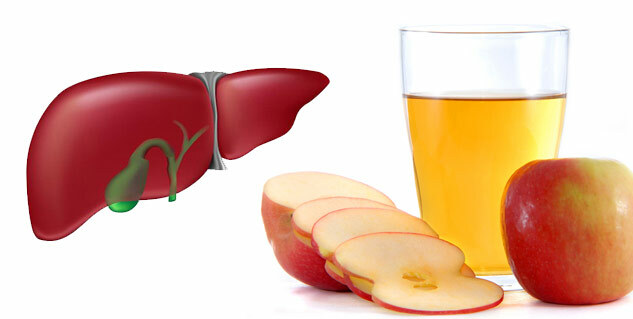 Flush out toxins from the liver to help it work properly. Keep drinking ample water during your detox to prevent dehydration. Apple cider vinegar is known for its healing properties for the skin but not many people are aware that it also contains detoxification properties that are effective in cleansing your liver. Detoxification is nothing but the removal of harmful toxins that build up in the body. However, there is no scientific back up yet that support the claim that apple cider vinegar is effective in detoxification, but expert believe that apple cider vinegar works wonders when it comes flushing out the toxins from the liver, thereby, helping it function properly. Take 2 teaspoon of apple cider vinegar and mix it with approximately 9 ml of water. Now drink this solution first thing in the morning. If you don’t like its taste, you can add honey to this mixture. Once you have consumed the mixture, wait for an hour. Eat fresh fruit or vegetables preferably, organic as they don’t contain any toxins. Consumption of organic fruits and vegetables boost the detox process and supply much needed minerals and nutrients. Now, add 1 to 2 tsp. of apple cider vinegar in approximately 9ml of water and drink it an hour before lunch. Your lunch should consist of plenty of fresh fruits and vegetables. Include salad with fresh lettuce, carrots, tomatoes and cucumber. Again prepare the solution by adding 1 to 2 tsp. of apple cider vinegar in approximately 9ml of water and drink this mixture an hour before supper. Have fresh fruits and vegetables at supper along with whole grain pasta or bread and cheese. Continue your detox for several days, if desired.